Billed as the most affordable Internet-ready phone with the "Nokia" name yet, the Nokia 215 is a cheap and very cheerful US$29 device that is very much a classic Nokia handset. Although it says "Nokia" on the outside, this is actually a Microsoft device. But underneath, this is a classic Series 30 handset with a 2.4" 240 x 320 pixel display, VGA resolution camera, Bluetooth and it has a built-in torch. The Nokia 215 can play MP3 files and some other formats, it comes with a microSD slot to add storage and there is also a basic stereo wired headset in the box. Although this is an Internet-capable phone, the download speeds are just 236 Kbps over a 2.5G EDGE connection in a dual-band 900/1800 MHz configuration only. The web browser is the well-regarded Opera Mini with support for Bing search, MSN Weather, Twitter and Facebook pre-installed. Users can share content with others using SLAM, which has been available in this sort of device for a long time. On top of that, there is the familiar Series 30 platform with all the usual applications and some games. 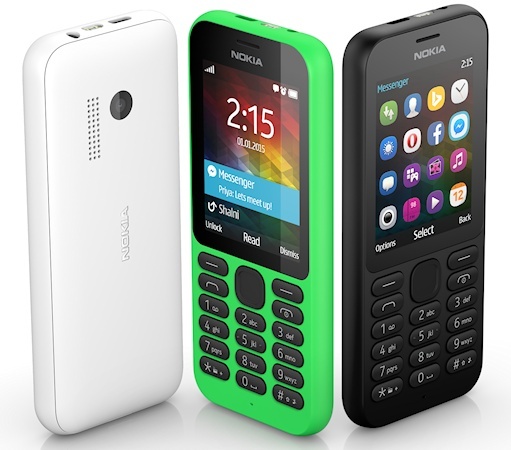 The Nokia 215 will be available in Single-SIM or Dual-SIM versions, with a standby time of 29 days for the Single-SIM one (a bit less for Dual-SIM) from the 1100 mAh battery. The 215 weighs just 78 grams and comes in bright green, black and white colours and features a classically elegant body which makes the 215 look much more expensive than it really is. The $29 quoted price does not include any carrier subsidy, or presumably any taxes. Local prices may vary. Microsoft say that the Nokia 215 should start shipping in select markets in the Middle East, Africa, Asia and Europe during Q1 2015.